AVG antivirus 7 discontinues on 15 Jan? I have gotten several times a message from AVG Antivirus Free 7.1 that says “Your AVG Anti-Virus 7.1 will be discontinued on 15. 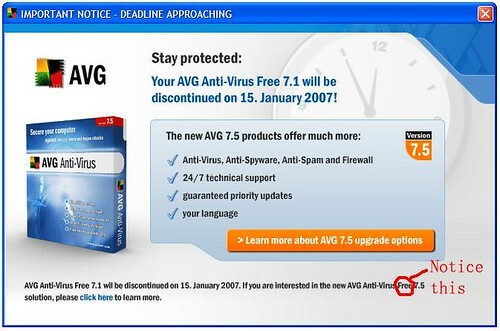 January 2007!” I always thought that avg is not going to be free anymore, since many free software that become paid have that kinds of notice. Until today I paid more attention on what it said I realized that it’s just a notice that tells us to upgrade to AVG 7.5 for free. I can’t upgrade to AVG 7.5 in the update manager, I had to go to AVG‘s website to download it and install it using the Repair Install option, after that restart and everything is done. I’m very happy that AVG keeps its antivirus software for free, I hope that they’ll also keep it for free in the future. I use AVG and am very happy with it, especially that it wins all sorts of awards and is free.